You know that scene in the remake of Father of the Bride, where Steve Martin goes to the grocery store to get hot dogs for dinner, but instead ends up having a serious meltdown because he can only buy a pack of twelve hot dog buns to go with his eight hot dogs, so he's ripping apart the packages and tearing out the four superfluous buns, all the while ranting and raving like a lunatic about the big-shot down at the wiener company who got together with the big-shot over at the bun company and conspired to rip off the American public, because they think the American public is a bunch of trusting nit-wits who will pay for anything rather than make a stink? Yeah, well, that was me today. Except that I was ranting and raving to a plumber who was crouching (cowering?) in our bathroom. I was making a serious stink. About his company's stinking business ethics. About the fact that they were trying to charge us twice to fix the same leak in our toilet. Only, it wasn't fixed. And, this was after they'd already been to our house three different times in a 24-hour period. After we'd gone away for the weekend and had come home to find water spilling down from the upstairs bathroom, through the floor, into the kitchen ceiling, and down the kitchen walls. After a frantic work week where my babysitter was sick and I was juggling kids and deadlines. After two nights where Charlie slept maybe fifteen minutes at a stretch. After we'd all been sick for two weeks straight. After I'd berated myself for days for having the pickle on my sandwich which had apparently caused Charlie to scream himself so hoarse that when he cried, all that came out was a little squeak. After my hair started falling out in clumps on the shower floor. After I'd started a new method of birth control that had basically just given me a month-long period. After I found out that I can no longer eat chocolate. As you can see, this plumber just happened to be at the end of my rope, and was the unfortunate recipient of my Serious Meltdown. 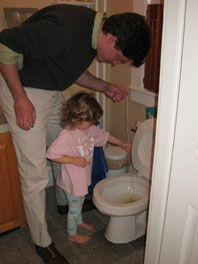 The day after the toilet was finally fixed, Julia was standing next to it, inspecting her handiwork before flushing: "Look at my poopies, mama! Look how big they are! Look how many I did (pointing)... one, two, fweeh, fouh..." (it's a bit like living with a frat boy). "That's great, Juje. Flush the toilet now," I responded. "OK!" After the flush, I heard a suspicious "Plop" and Julia crying, "Oooooooh noooooooo!" Not exactly what you want to hear the day after a plumbing-induced meltdown. "I dropped my magnet in the potty!" she cried, the tears already rolling down her red cheeks. Ugh. "Ok, Juje, I'll get it out," I said, grabbing the barbecue tongs and a pair of rubber gloves. Only, I couldn't reach it, and instead succeeded in pushing it further into the unreachable reaches of the toilet. Too embarrassed to call the plumber back, I called Will, who sussed out the situation as he consulted with Julia, the two of them scratching their heads as they bent over the toilet, Julia's lower lip still quivering. A few minutes later, I heard Will rifling around in the kitchen drawers asking, "Do we have any string?" as Julia ran down the hallway shouting "Yay!!! I'm going fishing with my dad!!!" We live in a fishing town. And, while the fishermen here will tell you that the fishing industry has gone down the toilet as of late, this is not exactly how I pictured Julia's first fishing expedition. But to her, it was the adventure of a lifetime. Will and Julia baited their line with another magnet, dangled it in the toilet for a few minutes, and wouldn't you know it—they had a successful catch. I had to laugh. Because only Julia...only Will...could turn this series of events into cause for celebration. Cause for joy. I was reminded of the time I was nursing Charlie on the couch, flipping through the channels, when I stumbled onto the funeral scene in Four Weddings and a Funeral, (did I mention that we've been watching a lot of movies lately?) where W. H. Auden's "Funeral Blues" is read as an elegy to a dead lover, and I was completely absorbed in the exquisite sadness of it all when Julia came bursting through the door, having just returned from grocery shopping with Will. She came screeching into the TV room, placing her sunny self firmly between me and the television, interrupting the sad scene. As I tried to peer over her shoulder and around her head, right at the pinnacle of the poem, Julia's bright, animated face kept bopping around, blocking my view of the television, as she cheered "Mama! I'm going to have cantaloupe for lunch! And PB&J! Yay!!!!" She was jumping up and down, clapping, bursting with happiness over her imminent feast. And, she brought me back down to the earth—back to life. These kids do that. When I get caught up in the hard times, and find myself in a moody downward spiral, they snap me out of it, with the simplest of things. Like the time I was up all night with Charlie, and not exactly happy about it, and he started belly laughing, and suddenly it was all OK. They bring back the fun. Or rather, they point out the fun that's been there all along, staring me in the face, if only I would open my eyes to it. I am now, Juje. I am now. Thanks to you.